Using a food processor, pulse together chickpeas, cumin, coriander, salt, pepper and egg to a coarse consistency. Add flour, cilantro and olive oil and pulse until mixture pulls from side of food processor. Place mixture into a large bowl and add the sauteed onions and garlic and combine. Cool mixture completely. Once cool, roll falafel dough into 1-inch rounds. Be careful not to pack the falafel or roll too tightly. Falafel will be too dense if packed together. Use a floured spoon or floured mini ice cream scooper to create the rounds. In a skillet, heat 1/2 inch of vegetable oil to 350 degrees. 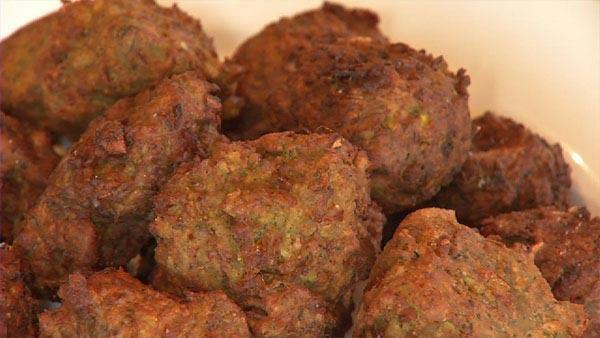 Cook falafel balls a few at a time, until golden brown, turning occasionally. Drain cooked falafel on paper towels.